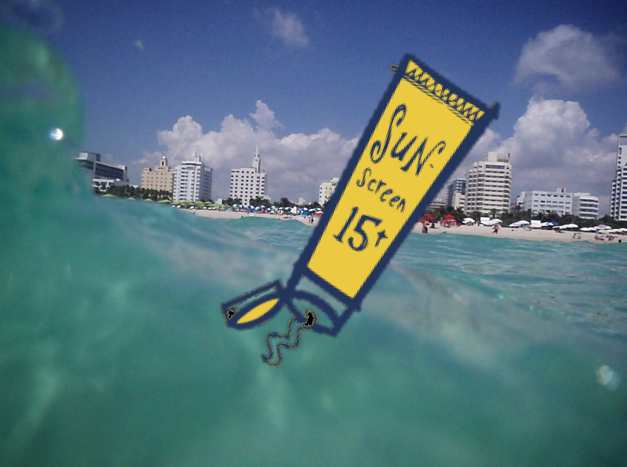 A new study out suggests some chemicals in sunscreen may harm marine organisms. Antonio Tovar, a marine chemist who co-authored the report, says a casual observation piqued his interest in this research: a rainbow colored plume coming from the beaches of his tourist-destination home, Majorca, Spain. It turned out to be sunscreen that was washing off from bathers. “So we decided to study what happens with the sunscreen when it touches the sea water,” he says. Tovar and the report’s co-author, David Sánchez-Quiles, tested about 20 different types of commercially available sunscreen. Pretty consistently, chemicals in the sunscreen slowed the growth of phytoplankton to the point where some died off. Titanium dioxide was particularly harmful. Phytoplankton are really tiny organisms that occupy the base of most marine life’s food chains. The concern is a decrease in the amount of phytoplankton is, or will, affect larger marine organisms. With millions of people venturing to the beaches of South Florida each year, many with skin ripe for the burning, are our phytoplankton dying off in droves? Tovar is quick to illustrate a few caveats to the study’s applicability here. “The Mediterranean is a small ocean, it’s a sea. The resident time of any pollutant that you add to the water is longer than in the open ocean. For example in your coast in Florida, probably the impact is lower than it is in the Mediterranean,” Tovar explains. Danielle McDonald, associate professor at UM's Rosenstiel School of Marine and Atmospheric Science, points out a larger issue at play. She studies how personal care products, including pharmaceuticals, affect marine life. “If you have a body of water that has sunscreen in it, or pharmaceutical compounds or human waste contaminants," McDonald says, "it’s not just going to be one compound that going to be in that water, it’s a whole suite of compounds -- sometimes 50 compounds." At the end of the day, those compounds interact with each other in unknown ways, like how humans react to taking several medications at once. McDonald says Tovar and Sánchez-Quiles’ work, if not directly applicable in South Florida, brings attention not only to the idea that chemicals affect wildlife, but to the direct effect human action can have on marine health. The Spanish scientists plan to do several more studies to see how sunscreen affects other animals and chemical processes in the ocean. Both Tovar and McDonald acknowledge there is a tradeoff, since sunscreen is one of the more common ways to protect exposed skin, and Tovar says his research doesn’t tip the balance against slathering up. He doesn’t advocate throwing out the Banana Boat just yet -- in fact, Tovar says he and his son will continue to wear sunscreen until further notice. Gov. Rick Scott sat down for half an hour this week with climate scientists who want him to take immediate action to deal with climate change. A few of those same scientists took their message to the Internet Thursday.